Today we led Mass for the whole school in church and we remembered the lives of St. Isaac Jogues, St. Jean de Brebeuf and their companions: six Jesuit priests and two holy men who lived over three hundred years ago. They were all from France but they died as martyrs when trying to preach in America. Throughout their lives, these men were punished and persecuted for their beliefs: they could all have made the choice to go back home to France but instead they chose to stay in North America to complete their mission. Eventually, they were captured and killed because they were blessing children on the streets of New York. 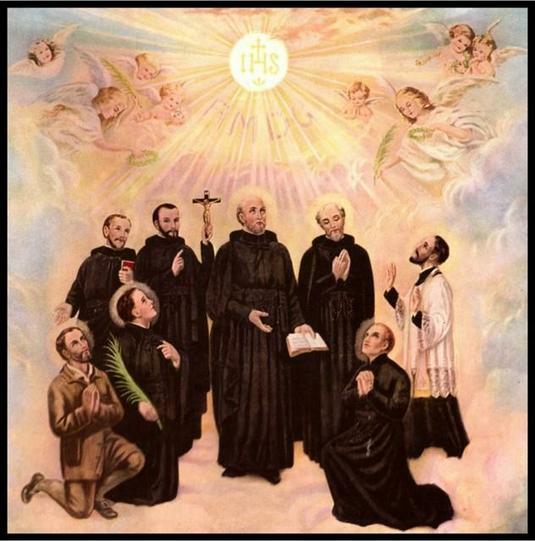 We hope that we can be as brave and courageous as Isaac Jogues and his companions were as we show our community that we are followers of Jesus.